For an app that really only does one thing, Battery Go is a handy utility for anyone taking a trip or going mobile. 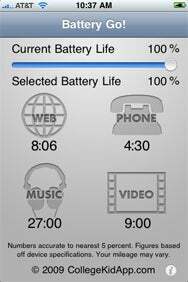 Using the stated battery life estimates from Apple, along with the actual battery life remaining on your phone, the $1 app shows you how long your iPhone will last if you only use it for Web browsing, talking on the phone, listening to music, or watching a video. Sliding Scale: Starting off with the estimates for battery life for a fully-charged phone, Battery Go lets you use a slider to see how much juice you have left for Web browsing, watching videos, listening to music, and talking on the phone based on your remaining power. Developer CollegeKidApp.com doesn’t provide options for setting the utility to show you an estimate based on partly using the phone and partly watching a movie. But it’s easy to guess at those amounts. Here’s one example. On a long car ride, I used Battery Go to help me determine whether my son could watch the movie Ratatouille after a full charge. The app indicated that the iPhone would last about four hours for video, so I knew he could—with some battery to spare for a phone call or two and checking e-mail. The tool worked as pitched: the iPhone lasted about three hours in total, which included using it for business tasks along the way. In addition to default readout, you can move a slider in Battery Go to see how much theoretical battery life will be left when the iPhone loses, say, half of its charge or when there is only about 10 percent or 20 percent remaining. For those who do not have a charger handy, or who do not want to fiddle with a charger while driving, Battery Go makes sense. The app has a simple function, it is well-designed with large icons and a slider, and works as stated. It is not always accurate, but the app does not claim to be, either—you can see a rough estimate on how long your iPhone will last. As such, I recommend the tool for a good idea of how you can use your iPhone when power is at a premium.